How to book a houseboat in Kerala is one of the most common questions we get asked. Everyone wants to experience floating through the lush green backwaters in a traditional rice barge but it can be confusing knowing how to book one and whether you should book one in advance. We recommend not booking a houseboat in advance so that you can see the boat for yourself and get a better price by haggling. We’ve written before about our strategy and what to expect in our detailed Kerala houseboat guide but we wanted to share this post from Dani and Jess of the Globetrotter Girls who have more recent experience booking a houseboat in Alleppey during the low season. We usually recommend booking a houseboat from quieter Kollam but surprisingly the girls were unable to get a good price from Kollam—Alleppey as the boat owners wouldn’t have enough business for the return journey. They did get a great deal by haggling in the ferry ports of Alleppey on the morning they wanted to start a trip and got a two bedroom houseboat for 7000 rupees per night. This could work in low season but in high season booking the day before is probably a better bet (like we did). Dani and Jess were not fans of Kollam either. I can understand it’s not a town for everyone—it doesn’t have obvious tourist appeal—but we enjoyed our short stay there for a slice of real India and for the excellent canoe tour we took. As well as their tips for booking a houseboat in Kerala also read about their relaxing experience on the houseboat, which was their highlight of India, and their photo essay of the fishermen in Fort Cochin. 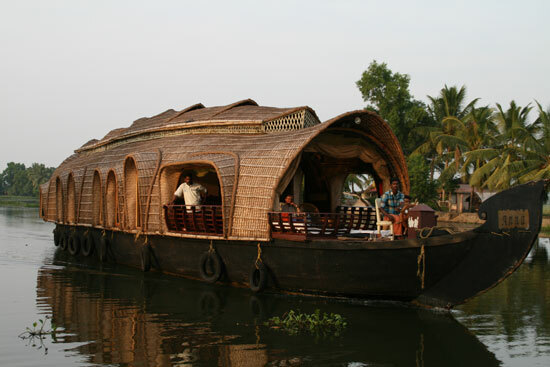 This entry was posted on Thursday, December 20th, 2012 at 11:25 pm	and is filed under Kerala Backwaters, Kerala Houseboats. You can follow any responses to this entry through the RSS 2.0 feed. Both comments and pings are currently closed.